In each newsletter, we are presenting an employee of the Müller-Guttenbrunn Group. 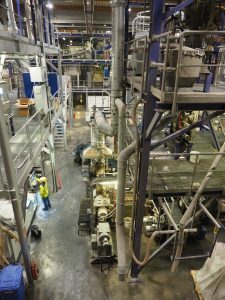 For this issue we had an interview with Christian Holzer, process engineer at MBA Polymers in Kematen. We talked about the commissioning of the plastics recycling plant and about the many details on which he now has an attentive eye. HOLZER: That’s right. The first time I was here was in the summer of 2005, when the pillars of the production hall were in the process of being erected. When the machines and equipment started to be installed early I started my job. This was October 2005, just eleven years ago. In other words, you were there right from the start? HOLZER: Indeed, it all fitted perfectly for me. After I first worked as an electrician and later in the computer industry, I was looking for a new challenge at that time. 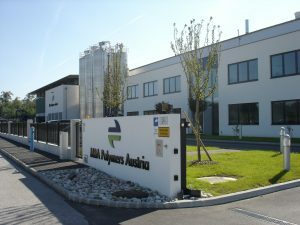 Then I heard that the Müller-Guttenbrunn Group was planning to build a new plastics recycling plant and I decided to have a closer look at it. A little later I started to work there. What were your first tasks at MBA Polymers? HOLZER: First of all I worked with the installation of the systems. As a trained electrician my tasks were primarily in electrical engineering, but I was also involved in some parts of the mechanics. Afterwards, I worked in the production shifts at the plant. Working on the construction of a completely new and innovative plant must have been exciting? HOLZER: Oh, yes, that was exiting! During the installation of the equipment we have noticed some things that cannot work as originally planned by our American engineers – all of the plants’ installations were never tried out at that scale. Then of course you need to make sure that the adjustments necessary are quickly planned and executed. When the plant ran then, we often asked the questions: Why can one solution work and another not? I had to read tons of documentation and wanted to know how others think about it. All in all it took us a good six months to get the necessary knowledge about the systems. But this is a completely normal learning curve process for a complex new system consisting of so many components. In the meantime, you have become process engineer at MBA Polymers. What are your current responsibilities? HOLZER: My core area of tasks consists of the programming of all systems and to work out how best to use them. Besides, I have a lot of other tasks like the handling of the repetitive tests. And in addition, I also have to keep in mind that everything that needs to be closed is really properly locked – for example, the safety locks for the drives and engines of the systems, so that we can safely work there. Do you also have an eye on the installation when closed? HOLZER: Yes, since I am also concerned about the system bookkeeping and the corresponding documentation. So, for example, I can see from our static and dynamic plant bookkeeping what happens with the plants’ installations and by doing so, I can recognize weak points. In addition, I also prepare weekly maintenance work during the planned downtime. Furthermore I keep an eye on the fact that our handling equipment on the factory floor remains operational and in good condition. And lastly I also take care of the different waters. What do you mean with “waters”? HOLZER: As a company, we have to comply with a range of requirements that are defined in our permits by the authorities. This starts with the “rain water”, but it also includes “greywater”, which is known from the sanitary areas. And it is particularly important that the appropriate handling of the “process water” works perfectly. Furthermore, resource monitoring is also part of my area of responsibility. At the same time, I always check whether there are any deviations in consumption of resources, so not only for water, but also for electricity or gas. So you have a really good overview of the operations? HOLZER: Yes and it is difficult to unite all my tasks under one name. Since the operation is not huge, one has to take care of many different issues in the end. It would not work if I would wear blinders of the type that horses wear, whilst I am going through the company. In any case, you need to look at the big picture, working in good teamwork as a group of engineers and maintenance guys to keep the plant going. In the past, one would probably have been called caretaker or housekeeper. Caretaker or housekeeper is a very modest and simplified name for your complex job with so much technology and so many tasks. What makes the work at MBA Polymers so interesting and attractive to you? HOLZER: For me it is definitely the fundamental conviction that recycling is the right way forward. By working with plastic, I have come to realize how harmful plastics can be to the environment. Therefore, plastic recycling is the only sensible way to keep the plastic in circulation for as long as possible, instead of throwing the material away or burning it. And of course, also the technology of the company has its appeal because plants like ours are unique and cannot simply be purchased on the market. We work with prototypes and in the meantime with many proprietary developments that needed to be designed, installed and optimized. This work is also fun because we do not need to go through many internal layers to be able to convert good ideas. Since you have a lot to do, do you work along a regular daily schedule? HOLZER: Well, in the morning, there are some fixed points. As we work in a 24/7 rhythm, I will try to get a status overview to start with and check whether everything is working properly. There are many important things that are happening in the background, without which the production simply would not work; for example if there would be a problem with the supply of compressed air. At 9 o’clock we have our daily production meeting. The responsible people are exchanging and updating each other with the latest developments on the production floor. After that meeting I am going into my day-to-day routines and that’s where it is really helpful to be flexible…..
How do you compensate for this big workload? HOLZER: The big workload is no problem for me. But when I leave the company, I really enjoy the free time. I must admit that it took a while for me to train myself to this, but now it works quite well. And how do you organize your leisure time? HOLZER: I do not have any particular hobbies. I like my time with my family. In our two-family house in Stephanshart, three generations live under one roof. My three grandchildren keep me young….. If the situation allows it, I like to ride my bicycle or simply enjoy mowing the lawn – this can be quite relaxing from time to time. We wish you a lot of fun with your grandchildren and please continue to enjoy your work! Thank you for the exciting insights into your working world.